This is equipment that is used when trying to remove excess moisture from a water loss, and is also used when drying out a property. 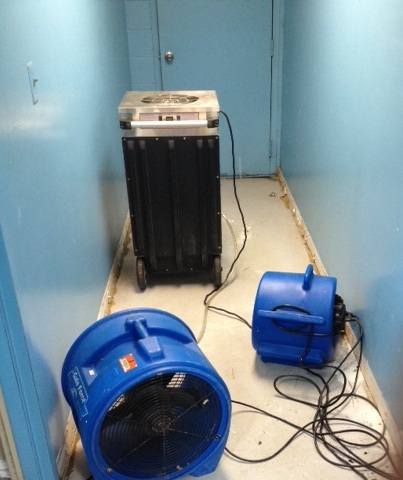 Air movers are quite efficient and high powered, and can quickly remove water from the premises. An air scrubber, which is the tall device, is used to remove particles, gases, and chemicals in any given area. For example, if there is a musty smell in the air due to water damage, an air scrubber can remove the odor efficiently. This piece of equipment is referred to as a moisture meter. It can detect if there is moisture present in any walls or flooring, and it helps minimize any defects such as shrinkage, cracks, and splits. Years of experience and high tech tools will not make a difference in the long run if the source of moisture on the property is not determined and dealt with effectively. This is an example of a high tech portable water pump. There are also different kinds of water pumps, such as mounted to the truck, but these are more efficient if the area affected isn’t very large. Water pumps are the easiest way to quickly remove large amounts of water from a property. This is a sump pump, and if this device does not work correctly, it can lead to flooding in your basement and home. One of the biggest reasons that homes flood is that their sump pump is either not working correctly, or it has failed.